Swedish cuisine is the traditional food of the people of Sweden. Due to Sweden's large North–South expanse, there are regional differences between the cuisine of North and South Sweden. Historically, in the far North, meats such as reindeer, and other (semi-) game dishes were eaten, some of which have their roots in the Sami culture, while fresh vegetables have played a larger role in the South. Many traditional dishes employ simple, contrasting flavours, such as the traditional dish of meatballs and brown cream sauce with tart, pungent lingonberry jam (slightly similar in taste to cranberry sauce). Swedes have traditionally been very open to foreign influences, ranging from French cuisine during the 17th and 18th centuries, to the sushi and cafe latte of today. A traditional julbord, or Christmas table. Swedish cuisine could be described as centered around cultured dairy products, crisp and soft (often sugared) breads, berries and stone fruits, beef, chicken, lamb, pork, eggs, and seafood. Potatoes are often served as a side dish, often boiled. Swedish cuisine has a huge variety of breads of different shapes and sizes, made of rye, wheat, oat, white, dark, sourdough, and whole grain, and including flatbreads and crispbreads. There are many sweetened bread types and some use spices. Many meat dishes, especially meatballs, are served with lingonberry jam. Fruit soups with high viscosity, like rose hip soup and blueberry soup (blåbärssoppa) served hot or cold, are typical of Swedish cuisine. Butter and margarine are the primary fat sources, although olive oil is becoming more popular. Sweden's pastry tradition features a variety of yeast buns, cookies, biscuits and cakes; many of them are in a very sugary style and often eaten with coffee (fika). Modern interpretation of the dinner table of Cajsa Warg (1703-1769), the most prolific Swedish cookbook author of the late 18th and early 19th centuries. Pickled herring, sour cream and chopped chives, potatoes and an egg half served at midsummer. The importance of fish has governed Swedish population and trade patterns far back in history. For preservation, fish were salted and cured. Salt became a major trade item at the dawn of the Scandinavian middle ages, which began circa 1000 AD. Cabbage preserved as sauerkraut and various kinds of preserved berries, apples, etc. were used once as a source of vitamin C during the winter (today sauerkraut is very seldom used in Swedish cuisine). Lingonberry jam, still a favourite, may be the most traditional and typical Swedish way to add freshness to sometimes rather heavy food, such as steaks and stews. Sweden's long winters explain the lack of fresh vegetables in many traditional recipes. In older times, plants that would sustain the population through the winters were cornerstones; various turnips such as the kålrot (rutabaga) (aptly named 'swede' in British English) were gradually supplanted or complemented by the potato in the 18th century. A lack of distinct spices made everyday food rather bland by today's standards, although a number of local herbs and plants have been used since ancient times. This tradition is still present in today's Swedish dishes, which are still rather sparingly spiced. Both before and after this period, some new Germanic dishes were also brought in by immigrants, such as people related to the Hanseatic League, settling in Stockholm, Visby, and Kalmar. Swedish traders and aristocrats naturally also picked up some food traditions in foreign countries; cabbage rolls (kåldolmar) being one example. Cabbage rolls were introduced in Sweden by Karl XII who came in contact with this dish at the time of the Battle of Poltava and during his camp in the Turkish Bender and later introduced by his Ottoman creditors, who moved to Stockholm in 1716. An early version of kåldolmar was first published in 1765 in the fourth edition of Hjelpreda i Hushållningen för Unga Fruentimber by Cajsa Warg, though it was closer to the Turkish dolma than later dishes. Swedish husmanskost denotes traditional Swedish dishes with local ingredients, the classical everyday Swedish cuisine. The word husmanskost stems from husman, meaning 'house owner' (without associated land), and the term was originally used for most kinds of simple countryside food outside of towns. Genuine Swedish husmanskost used predominantly local ingredients such as pork in all forms, fish, cereals, milk, potato, root vegetables, cabbage, onions, apples, berries etc. ; beef and lamb were used more sparingly. Beside berries, apples are the most used traditional fruit, eaten fresh or served as apple pie, apple sauce, or apple cake. Time-consuming cooking methods such as redningar (roux) and långkok (literally 'long boil') are commonly employed and spices are sparingly used. 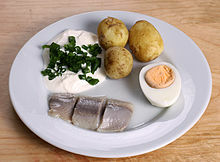 Examples of Swedish husmanskost are pea soup (ärtsoppa), boiled and mashed carrots, potato and rutabaga served with pork (rotmos med fläsk), many varieties of salmon (such as gravlax, inkokt lax, fried, pickled), varieties of herring (most commonly pickled, but also fried, au gratin, etc. ), fishballs (fiskbullar), meatballs (köttbullar), potato dumplings with meat or other ingredients (palt), potato pancake (raggmunk), varieties of porridge (gröt), a fried mix of pieces of potato, different kind of meats, sausages, bacon and onion (pytt i panna), meat stew with onion (kalops), and potato dumplings with a filling of onions and pork (kroppkakor). Many of the dishes would be considered comfort food for the nostalgic value. Dishes akin to Swedish husmanskost and food traditions are found also in other Scandinavian countries; details may vary. Sweden is part of the vodka belt and historically distilled beverages, such as brännvin and snaps, have been a traditional daily complement to food. Consumption of wine in Sweden has increased during the last fifty years, partly at the expense of beer and stronger alcoholic beverages. In many countries, locally produced wines are combined with local husmanskost. Husmanskost has undergone a renaissance during the last decades as well known (or famous) Swedish chefs, such as Tore Wretman, have presented modernised variants of classical Swedish dishes. In this nouvel husman the amount of fat (which was needed to sustain hard manual labour in the old days) is reduced and some new ingredients are introduced. The cooking methods are tinkered with as well, in order to speed up the cooking process or enhance the nutritional value or flavour of the dishes. Many Swedish restaurateurs mix traditional husmanskost with a modern, gourmet approach. Internationally, the most renowned Swedish culinary tradition is the smörgåsbord and, at Christmas, the julbord, including well known Swedish dishes such as gravlax and meatballs. In Sweden, traditionally, Thursday has been soup day because the maids had half the day off and soup was easy to prepare in advance. One of the most traditional Swedish soups, ärtsoppa is still served in many restaurants and households every Thursday, a tradition since the middle ages. Ärtsoppa is a yellow pea soup, commonly served with pancakes as dessert. This is a simple meal, a very thick soup, basically consisting of boiled yellow peas, a little onion, salt and small pieces of pork. It is often served with mustard and followed by a dessert of thin pancakes (see pannkakor). The Swedish Armed Forces also serve their conscripts pea soup and pancakes every Thursday. Potatoes are eaten year-round as the main source of carbohydrates, and are a staple in many traditional dishes. Not until the last 50 years have pasta or rice become common on the dinner table. There are several different kinds of potatoes: the most appreciated is the new potato, a potato which ripens in early summer, and is enjoyed at the traditional midsummer feast. New potatoes at midsummer are served with pickled herring, chives, sour cream, and the first strawberries of the year are traditionally served as dessert. The most highly regarded mushroom in Sweden is the chanterelle, which is considered a delicacy. 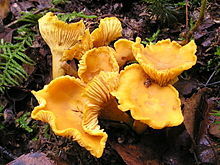 The chanterelle is usually served as a side dish together with steaks, or fried with onions and sauce served on an open sandwich. Second to the chanterelle, and considered almost as delicious, is the porcini mushroom, or karljohansvamp, named after Charles XIV John (Karl XIV Johan) who introduced its use as food. In August, at the traditional feast known as kräftskiva, crayfish party, Swedes eat large amounts of crayfish, boiled and then marinated in a broth with salt, a little bit of sugar, and a large amount of dill weed. 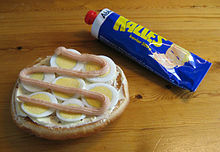 An open sandwich with hard-boiled eggs and smoked cod roe caviar from a tube. 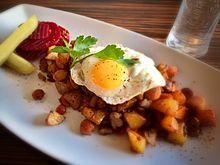 Meals consists of breakfast in the early morning (frukost), a light lunch before noon (lunch), and a heavy dinner (middag) around six or seven in the evening. It is also common to have a snack, often a sandwich or fruit, in between meals (mellanmål). Most Swedes also have a coffee break in the afternoon, often together with a pastry (fika). In all primary schools, and most, but not all secondary schools, a hot meal is served at lunch as part of Sweden's welfare state. According to the Swedish school law, this meal has to be nutrient dense. Breakfast usually consists of open sandwiches (smörgås), possibly on crisp bread (knäckebröd). The sandwich is most often buttered, with toppings such as hard cheese, cold cuts, caviar, messmör (a sweet spread made from butter and whey), ham (skinka), and tomatoes or cucumber. Filmjölk (fermented milk), or sometimes yogurt, is also traditional breakfast food, usually served in a bowl with cereals such as corn flakes, muesli, or knäckebröd, and sometimes with sugar, fruit or jam. Porridge is sometimes eaten at breakfast, made of rolled oats eaten with milk and jam or cinnamon with sugar. Common drinks for breakfast are milk, juice, tea, or coffee. Swedes are among the most avid milk and coffee drinkers in the world. 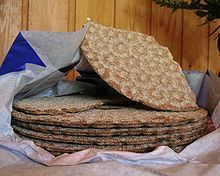 Swedish knäckebröd, or crisp bread. Swedes sometimes have sweet toppings on their breads, such as jam (like the French and Americans), or chocolate (like the Danes), although many older Swedes chose not to use these sweet toppings. However, orange marmalade on white bread is common, usually with morning coffee or tea. Many traditional kinds of Swedish bread, such as sirapslimpa (less fashionable today, but still very popular) are somewhat sweetened in themselves, baked with small amounts of syrup. Like in many other European countries, there are also lots of non-sweetened breads, often made with sourdough (surdeg). Swedish breads may be made from wholegrain, fine grain, or anything in between, and there are white, brown, and really dark (like in Finland) varieties which are all common. Barkis or bergis is a localised version of challah usually made without eggs and at first only available in Stockholm and Göteborg where Jews first settled but now available elsewhere. Blodpudding Black pudding The Swedish name literally means 'blood pudding'. Sweetened and spiced, it is eaten with lingonberry jam, and sometimes bacon. Blodkorv Blood sausage Other than pig blood, the ingredients include flour, pork, raisins and spices. Bruna bönor och fläsk A classical Swedish dish consisting of pork with stewed brown beans. Falukorv Sausage, big and thick, originating from Falun. The lifts and pumps at the Kopparberg copper mine in Falun were, during the 16th and 17th centuries before the introduction of steam engines, powered by oxen. When these oxen died from strain or old age, the skin was turned into leather ropes used in the mine, and some of the meat was turned into Falukorv sausages. Fiskbullar Fishballs, made from minced white fish meat. Fläskpannkaka A thick pancake with diced pork, baked in a form in the oven. Flygande Jacob Casserole based on chicken with bananas, peanuts and bacon. Invented in the 1970s. Gravlax Salmon cured with salt and sugar with herbs. Grisfötter Pig's trotters served with rödbetor. Inkokt lax Boiled salmon, together with onion and carrots, in a mixture of water, vinegar, salt, sugar and some other spices. Usually eaten cold, commonly together with mayonnaise spiced with dill and lemon. Inlagd sill Herring pickled by the use of Acetic acid, water, sugar, ground allspice, red onion, carrot and salt. Isterband Sausage, from Småland, made of coarsely ground pork, barley and potatoes. It is prepared by first fermenting it and then lightly smoking it. This method of cooking creates a distinct, both acidic and slightly smoky flavour. It is traditionally eaten with dill-stewed potatoes and pickled beetroot. Janssons frestelse Jansson's temptation. Potato casserole made of grated potatoes, onion, 'anchovy' and cream; the fish used is usually the sprat, a different species, but similarly spiced. Julskinka Cured ham, boiled and breaded with mustard, bread crumbs and egg, translates as Christmas ham. The Swedish equivalent to Christmas turkey. Kåldolmar Cabbage rolls. These are a Swedish variation of the Turkish dolma, and date back to when Charles XII returned to Sweden from the Ottoman Empire. Kalops Meat stewed with onion, vegetables and spices. Ketchup Pasta Pasta with ketchup. Köttbullar Meatballs made from meat and herbs tightly rolled together, frequently served with mashed potatoes and pickles. Korv Stroganoff Sliced sausage pieces (usually falukorv) served in a creamy tomato sauce, a cheaper Swedish variation of Beef Stroganoff. Köttsoppa med klimp Soup, made from beef and root vegetables, served with klimp, a distinct Swedish dumpling. Kroppkakor Dumplings made of pre-boiled potatoes, filled with pork. Lutfisk Lye fish made of stockfish. Palt Dumplings made of unboiled potatoes, filled with pork. Paltbröd A type of tunnbröd baked with blood. Traditionally served leached with white sauce and fried pork. Pannkakor A thin pancake fried in an ordinary frying pan. In some parts of Sweden, all thin pancakes are called plättar. Pölsa Similar to hash or Scottish haggis without casing. Prinskorv Small sausages, hot dog-style. Pyttipanna Mix of chopped and fried meat, onions, pre-boiled potatoes, often prepared from leftovers. Other ingredients are often added as well, such as sausages, bacon or even salmon (instead of the meat). Raggmunk Potato pancakes. Usually eaten with lingonberry jam and sometimes fried slices of pork belly. Rotmos med fläsk Mashed root vegetables, usually rutabaga, carrots and sometimes potatoes, served with long-boiled salted pork loin. Räksmörgås Open sandwich with prawns, egg and mayonnaise. Lettuce, tomato or cucumber are commonly added, usually topped with lemon and dill. Sillsallad Herring Salad A Russian style chopped cold-salad side dish made with pickled herring, boiled cold potatoes, boiled cold beets, minced raw onion, fresh dill, and sour cream. Smörgåstårta Sandwich cake Like a very big multi-layer sandwich. Comes with many different fillings and toppings, often including shrimp, ham, mayonnaise, salad, and preserved fruits. Stekt fläsk med löksås och potatis Pork with onion sauce and potatoes. Stekt strömming Fried herring Fileted fresh herring, two filets put flesh to flesh, skin out, with dill, salt and ground white pepper between and breadcrumbs on the outside, and then fried in butter until golden. Eaten with mashed potatoes and lingonberry jam. Very different from surströmming. Surströmming Fermented Baltic herring Being fermented, surströmming has a strong odour and unique flavour and is considered an acquired taste even among Swedes. Usually eaten with thin hard bread. Sylta Swedish Head-Cheese Made primarily from finely chopped pork pulled soft from a boiled pig-head and mixed with the gelatin from the skull and various spices and pressed to form a loaf that is served chilled so that the gelatin sets. Other ingredients are sometimes added to the mix such as veal. This is known as pressylta and is traditionally served at Christmas. Wallenbergare Patty of ground veal, cream, eggs yolks and coated in breadcrumbs. A limited range of fish and other seafood is an important part of the Swedish cuisine. Farmed salmon from Norway has become increasingly popular. And pickled, sweetened herring, inlagd sill, is the most traditional of Swedish appetizers. Shrimp and lobster are specialties of the Skagerrak coast. There is also the fermented Baltic herring that with its pungent aroma is both loved and hated ‒ in Swedish: surströmming. Ris à la Malta (Ris à l'amande), a Christmas dessert. Äggost A dish originating from Bohuslän. In the southern parts of the county it is traditionally served as a dessert along with whipped cream, sugar and blackberry jam, but in the northern parts it is usually seen as a main dish or breakfast and often served with pickled herring. Gotländsk saffranspannkaka Rice pudding dessert with saffron originating in Gotland usually served with jam or whipped cream, or dewberry jam. Kalvdans A classical Scandinavian dessert. It is made from unpasteurized colostrum milk, the first milk produced by a cow after giving birth. Klappgröt Semolina pudding mixed with juice from either red currant, lingonberries, raspberries, blackberries etc. and then stirred or blended until the texture is fluffier. Eaten cold. Ostkaka Swedish cheesecake (vdifferent from American cheesecake). Smördegspaj Butter dough based pie. Various kinds of pies and cookies are typical desserts, mostly served with coffee. Typical pies are apple pie, blueberry pie and rhubarb pie. Spettekaka A sweet dry hollow Swedish cake, shaped like a cylinder, and similar to Meringue, found only in a southern province of Sweden, Scania. Våfflor Waffles Often served with jam and whipped cream or ice cream. Waffles also have their own day on 25 March. In recent years, American brownies, cookies, and cupcakes have become popular in Swedish cafés and restaurants. Wienerbröd A Danish pastry; comes in several varieties and shapes; very similar to a Danish pastry in the US. Chokladboll Chocolate ball. A round chocolate-flavoured butter ball with oatmeal, cocoa and sugar, coated in coconut flakes or pearl sugar. Chokladboll is something of a misnomer as it contains no cocoa butter. Kringla A small pretzel-shaped (sweet) cookie with pearl sugar on top. Punschrulle Punsch-roll A small cylindrical pastry covered with green marzipan with the ends dipped in chocolate, and inside a mix of crushed cookies, butter, and cacao, flavoured with punsch liqueur. This pastry is often called dammsugare ('vacuum cleaner'), referring not only to its appearance, but also to the practice of the pastry baker collecting crumbs from the day's cookies to make the filling. Other names are arraksrulle (as arrak (arrack) is an ingredient in punsch) and '150-ohmer' (owing to the brown-green-brown colouring). Biskvi A small round pastry with a base: made from almonds and sugar, filled with butter cream and covered with a thin layer of chocolate. First made in France during the 19th century. Prinsesstårta Princess cake A large cake, made of sponge cake layered with whipped cream, and custard under a green marzipan coating with powdered sugar on the top; often decorated with a pink marzipan rose. Budapestbakelse Budapest pastry Basically made from sugar, egg white, hazelnuts, whipped cream, and pieces of fruit like apricot or mandarine, decorated with a little chocolate and powdered sugar. Napoleonbakelse Napolitain Made of pastry dough, whipped cream, custard and jam, topped with icing and currant jelly. Kladdkaka A chocolatey and sticky flat cake. Toscakaka Light sponge topped with caramelized almonds. Arraksboll A ball flavoured with arrak, similar in appearance to a chokladboll but very different taste. In the summer, various seasonal fruit cakes are common. Strawberry and cream cake is highly regarded. Strawberries are also often eaten on their own with sugar and milk or cream. In the late summer and autumn, apple cakes and pies are baked. The apple cake is often served with vanilla custard, but sometimes with ice cream or whipped cream. Ischoklad Coconut oil mixed with chocolate. Marmelad 'Marmalade candy', rectangular fruit and pectin based candy in various colours. Lussekatt Saffron bun, a Swedish saffron bun eaten on the Saint Lucia celebration (13 December). Pepparkaka Similar to a ginger snaps (has been eaten since the 14th century and baked at the monastery of Vadstena since 1444); associated with Christmas. Semla With the new year, the fastlagsbulle (Lenten bun), or semla, is baked. It is a wheat bun with a cream and almond paste filling, traditionally eaten on Shrove Tuesday. Saltlakrits Liquorice candy flavoured with ammonium chloride. Polkagris Traditional peppermint stick candy from Gränna, also made in other flavours. Ahlgrens bilar A marshmallow candy shaped like a car. Marketed as 'Sweden's most purchased car' (Swedish: Sveriges mest köpta bil). Sockerbitar Similar to square, chewy marshmallows. Geléhallon An early form of gelatine-based candy. Daim Formerly called Dime in the UK. Sweden is second placed among the heaviest coffee drinking countries in the world. Milk consumption in Sweden is also very high, second only to Finland. Milk is bought in milk cartons, and it is no coincidence that Tetra Pak, the world's largest maker of milk cartons, was founded in Sweden. Milk is considered the standard drink to have with meals during weekdays in many families, for both children and adults. Mumma A traditional Christmas beverage. 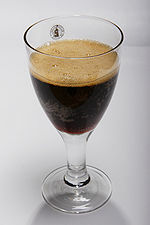 Usually a mix of porter or another dark beer, some light beer (pilsner), port wine (or some other wine), and something sweet (sockerdricka or julmust); commonly spiced with cardamom. Fruit soups, especially rose hip soup and bilberry soup, are eaten or drunk, usually hot during the winter. The most important of stronger beverages in the Swedish cuisine is Brännvin, which is a general term that includes mainly two kinds of beverages: akvavit and vodka. When consumed traditionally it is often served as a snaps, but vodka is also popularly consumed as a drink ingredient. Renat is often considered to be the national vodka of Sweden, but other highly popular brands are Explorer Vodka and Absolut Vodka, the latter being one of the world's best-known liquor brands. Most forms of brännvin have around 40% alcohol. The production of hard liquor has a tradition dating back to the 18th century and was at a high in the 1840s. Since the 1880s, the state-owned Systembolaget has a monopoly on selling spirits with more than 3.5% ABV, limiting access. Hembränt (moonshine) used to be made in rural Sweden, but production has lessened in recent years due to more liberal rules for the import of alcohol as well as increased smuggling. 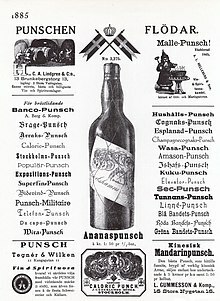 Punsch is a traditional liqueur in Sweden that was immensely popular during the 19th century. It was adopted as the drink of choice by university students, and many traditional songs from that time are about the consumption of punsch or are meant to be sung during the collective festivities that were part of the cultural life in the universities' student associations at the time and still is. Beer is also widely consumed in Sweden and the typical Swedish beer is lager of a bright and malty kind. The brands Pripps Blå and Norrlands Guld are common examples. In the last few decades, many small breweries (microbreweries) have emerged all over Sweden offering a wide range of styles and brands. Nils Oscar Brewery, Dugges Ale och Porterbryggeri and Närke Kulturbryggeri are examples of these young Swedish microbreweries. Many microbreweries in Sweden are inspired by the US craft beer movement, brewing American styles or styles commonly associated with American craft breweries, e.g. American Pale Ale and American IPA. Brödinstitutet ('The Bread Institute') once campaigned with a quotation from the Swedish National Board of Health and Welfare, recommending eating six to eight slices of bread daily. Drinking milk has also been recommended and campaigned for by the Swedish National Board of Health and Welfare; it is often recommended to drink two to three glasses of milk per day. A survey conducted on behalf of Mjölkfrämjandet, an organisation promoting consumption of Swedish milk, concluded that 52% of Swedes surveyed drink milk at least once a day, usually one glass with lunch and another glass or two in the evening or morning. Low-fat products, wholemeal bread and other alternatives are common ‒ grocery stores usually sell milk in four or five different fat levels, from 3% to 0.1%. ^ a b Rob Hincks, "Swedish semla: more than just a bun Archived 2011-06-06 at the Wayback Machine," Feb. 20, 2012. ^ "School lunches". www.livsmedelsverket.se. Retrieved 2017-10-03. ^ "Swedish Kroppkakor Recipe". Food.com. Retrieved 14 May 2015. ^ "Pyttipanna Recipe". Honest Cooking. Retrieved 14 May 2015. ^ Jones, Lora (2018-04-13). "Coffee: Who grows, drinks and pays the most?". BBC News. Retrieved 2018-05-13. ^ Carl Deleen, Tysk och swensk ordbok Örebro 1836, p. 554. ^ "93 % av svenska folket tycker mjölk är nyttigt". June 2004. Archived from the original on November 7, 2007. Retrieved 2009-03-05. Wikimedia Commons has media related to Cuisine of Sweden. This page was last edited on 31 March 2019, at 02:41 (UTC).